WILL ARTIFICIAL INTELLIGENCE REPLACE CUSTOMER SERVICE AGENTS? 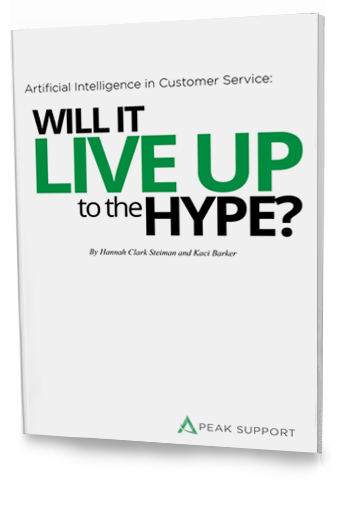 Whether you own a call center, work in one, or run a multinational service team, our comprehensive white paper will answer your questions about the future of AI in customer service. Fill out the form to download the eBook! When do the “experts” say AI will replace human agents … and what’s the real answer? The 3 major challenges - and 4 smaller ones - hindering the growth of AI in call centers. 7 companies - from startups to IBM - competing to lead the way in call center AI. What ticket volume is required for an AI bot to reach 20%, 40%, and 80% accuracy? What percentage of tickets can AI bots answer today, without human review? How quickly will artificial intelligence improve? Click the button below to get your free, printable white paper delivered to your inbox today.